Hikawa Shrine (氷川神社) is one of the oldest shrine in Japan. It was established in 473 B.C.E. The Saitama's former city, "Omiya," was named after this shrine. Hikawa Shrine is one of the major groups of Shrine in Kanto, especially around Arakawa River. Also, it is the major spot in Omiya area. As the primary shrine of Musashi, many people worship this shrine for praying wishes for their happy everyday life. Many shrine closed its gates at night. 1. use Tobu Noda Line to Kita-Omiya. The Matsuri of the Shrine: August 1. 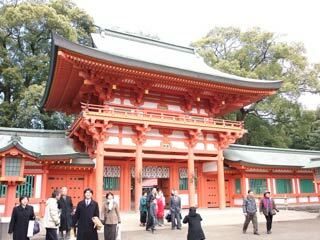 Emperor Daigo set Hikawa Shrine as the "Myojin Taisya," the highest rank of Japanese Shrine. Hikawa Shrine has a 2km long of Sando. It runs the south of the shrine. There are three huge Torii Gates and beautiful Keyaki Tree Avenue.